The battle over new rules for unmanned aircraft in the U.S. is pitting the drone industry's two starkly different cultures against each other: high-tech entrepreneurs versus big aerospace and defense companies. Boeing Co. BA -0.35% , Northrop Grumman Corp. NOC +0.22% and other marquee aerospace names are the industry's incumbents, with thousands of drones sold to the U.S. and other militaries. Many of their drones are high-powered and high-priced, some with wingspans wider than a Boeing 737 and reported price tags of as much as $93 million. Meanwhile, upstarts like PrecisionHawk Inc. and SZ DJI Technology Co. are pitching lightweight, low-cost devices that entrepreneurs are using to film movies, inspect homes and monitor crops. Many of their drones are hand-held and some can be bought at Wal-Mart for a few hundred dollars. These drones are poised to capture the commercial market as new rules open it up, analysts say. The two groups tend to have different sensibilities and different target customers, even meeting at different conferences. They've coexisted amicably, with the big firms serving the military and the smaller players serving hobbyists. But now their relationship has soured over efforts to influence long-delayed drone regulations and their increasing convergence in the market as demand for drones takes off. Lacking clear rules for unmanned aircraft, the Federal Aviation Administration has prohibited their commercial use without its approval. Many filmmakers, farmers and others have been using smaller drones without government consent, but the FAA has approved just two commercial drones, both for use in Alaska. The FAA plans to propose rules for small drones later this year that could help decide whether the drone incumbents or upstarts thrive. Many small drone makers and entrepreneurs accuse the larger companies of pushing for restrictive regulations that will create barriers in the market and protect the incumbents' position atop it. "No one says it out loud, but we all know that's the situation," said Sven Juerss, chief executive of German drone maker Microdrones GmbH. The incumbents "invested millions in the bigger birds, and they want to sell them as long as possible." The bigger drone makers reject that claim. They have lobbied extensively on Capitol Hill, but they say they are leaning on the FAA to open up the skies to drones from all manufacturers—as long as they're safe. "It's one of those urban myths that I've seen zero evidence of being true," said John Langford, CEO of Aurora Flight Sciences Corp., which helps develop and build some of the largest drones. "There's nobody who has a more genuine interest in the safe evolution of [drone] rules than the big players, because, remember, they have the most to lose if it's not done right." Some observers say the drone industry is ripe to become a classic story of tech disruption, in which lower-cost, less-powerful devices overtake the market from the more expensive and advanced incumbents. They liken the current moment in drones to the shift from big, industrial computers to PCs in the 1980s. The big aerospace companies "are the [computer] mainframes of this industry…We're the personal computers," said former Wired magazine editor Chris Anderson, who founded California drone maker 3D Robotics Inc. in 2009. "This is exactly what happens from industry to industry: The mammals emerge, they're small and pathetic, but they get better, faster, and then you have an evolutionary shift." Patrick Egan, a drone advocate from Sacramento, in 2007 shut down his commercial-photography business that used a homemade drone after the FAA effectively banned commercial-drone use. He has used a drone-news website and related podcast to become one of the most prominent critics of the FAA and large aerospace companies, which he accuses of colluding to rig rule making. Last month, a few days before a drone trade show in Orlando, Mr. Egan hosted his own conference for small drone makers and users in a room overlooking San Francisco's Golden Gate Bridge. Mr. Egan charged attendees $15 for a sandwich, a soda and a cookie. The four-day trade show in Orlando, which drew thousands of people and dozens of big companies like Lockheed Martin Corp. LMT +0.38% and General Dynamics Inc., GD -0.43% had open bars every afternoon and a networking gala in the Wizarding World of Harry Potter at Universal Orlando Resort. Mr. Egan opened his event by criticizing FAA advisory committees, which are chaired by executives from the big aerospace companies, for recommending rules that he said would harm entrepreneurs. For instance, a committee with the standards-making organization ASTM International recommended that the FAA require drone makers to have extensive quality-assurance programs and produce military-standard manuals for their devices. "Gee whiz, I don't know where I'm going to fit the tech-writing team because I'm going to have the quality assurance team in the garage," he told the crowd. "I'm not taking this one lying down." Ted Wierzbanowski, a former executive of AeroVironment Inc., AVAV -2.24% which supplies more drones to the U.S. military than any other company, chairs the ASTM committee and said recommendations were made with the input of about 130 members. Membership in the committee is open to anyone for $75 a year. "We bend over backwards soliciting support and participation from everyone and anyone," he said. 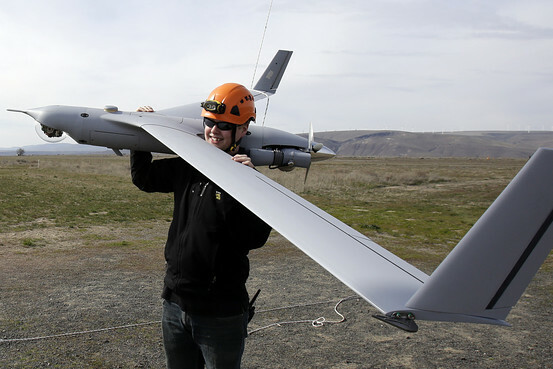 Paul McDuffee, who heads government relations for Boeing-owned drone maker Insitu Inc., said the aerospace firms are lobbying for rules that will benefit all makers and users. "Right, wrong or indifferent, [Mr. Egan] is still going to benefit from this, yet he continues to throw rocks at those of us who have worked hard to get to this point," he said. Michael Toscano, CEO of the Association for Unmanned Vehicle Systems International, the biggest drone trade group, disputes that it is "big versus small." He said the users and makers of smaller drones are focusing their frustration with the FAA onto larger drone makers, who aren't in such a hurry for rules. "The larger guys still have a defense market," he said, whereas the smaller companies "can see the fruit; they just can't pick it and eat it." Although most of the incumbents' drones are large and expensive, several companies have developed smaller devices for the commercial market. AeroVironment sells a quadcopter called the Qube that is used by several police departments, and Lockheed Martin is already leasing to farmers its Indago quadcopter, which can be folded into a briefcase. Still, both companies said they aren't targeting consumers looking for low-cost drones, adding that their core customers remain militaries and big corporations. Indeed, Andreas Neuman, a former U.S. Air Force drone pilot turned drone consultant, said the big aerospace companies understand their aircraft are overqualified and too expensive for most commercial uses. He said they are focused on securing lucrative, large-scale contracts with big companies, such as the five-year deal AeroVironment recently signed with BP BP.LN -1.93% PLC for its Alaska operations. A September report by the U.S. Department of Transportation said that most commercial drones will come "from the Radio Controlled (RC) type vehicle makers as opposed to the suppliers of DoD and public agency aircraft." The report predicts that "as [drone] usage becomes more mainstream, DoD suppliers are expected to seriously enter the commercial marketplace."